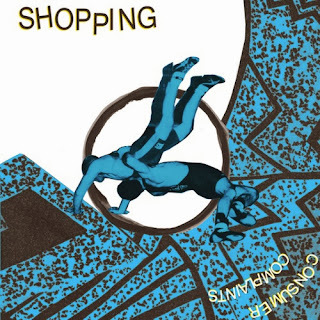 Have you ever seen anyone doing acrobatics in a shopping environment? The answer is perhaps not and that leads us neatly (not so obviously) into the recently released album Consumer Complaints from the band name after that most necessary of domestic activity, Shopping. There is actually much to like about this album – and it’s far more likely that a trip down to Shoreditch to my favorite indie record store to hunt this down would make me happy. The songs are all short and snappy and often titled in a somewhat eccentric manner. The whole album, in fact, feels delightfully eccentric in that uniquely indie way. On first listen Consumer Complaints feels oddly disjointed but never in a way that affects the listening experience too much. Subsequent visits reveal sonic tics and lyrics that make the music very memorable. One of our key tracks is Hard As Nails – with a slightly threatening aura that resembles a visit to an dark yet very snug underground club in the dead of night. This feeling develops from here as Long Way Home, featuring a subtly punk arrangement that never gets too aggressive but still packs a punch with the listener. Indeed the second half of the album is the most easily accessible, with the eerily psiren like calls of the first handful of tracks luring through the darkness into a very pleasing place indeed. For Your Money is a subtler take on their sound, telling a story of a city man with job ‘that ain’t pretty’ that many can relate you in its urban fairytale like setting. The storytelling rock genre is certainly a good one – and For Your Money is certainly a highlight. You couldn’t really have stated it better that that. Want this album? Then buy this album! It’s certainly worth your cash!